We are living in a disrupted and unpredictable world and universities have a responsibility to their students to keep up with this rapid pace of change. That was the key message from the Universities Canada Univation forum held in Ottawa on Feb. 5-6. 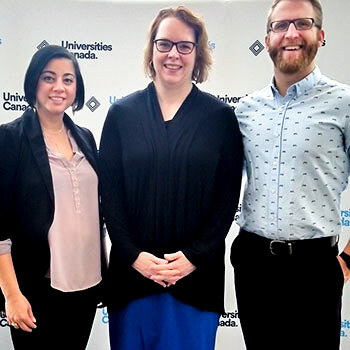 Two Laurier students accompanied Deborah MacLatchy, Laurier President and Vice-Chancellor, to the conference, which brought together university and business leaders, students and entrepreneurs to discuss how universities can best prepare students for changing work models and technological disruptions. MacLatchy moderated a panel discussion on Innovations to Improve Student Access and Success and delivered a keynote address that highlighted Laurier's Access to University — an initiative that has improved university access to non-traditional students. Sharline Doss and Adam Rooke, students in the Masters of Education program, also took part in the forum, attending the workshops and panel discussions. What stood out for Doss at the conference is how much more employers are asking of graduates, but she is confident Laurier is preparing her to meet these demands. "We are ahead of the curve with some of our cutting edge programs. I believe the reflexive approach Laurier has provided me through the Masters of Education program has helped me develop essential skill such as critical thinking, self-awareness and leadership," she said. For Rooke, the take home message was the importance of collaboration and interdisciplinary work. "In order to innovate the way we teach at universities, we need to ensure that there are opportunities for students to connect with others from different faculties and backgrounds," he said.